Blackmagic Design's HyperDeck Studio Mini is a portable broadcast quality record/playback deck that can also be rackmounted. 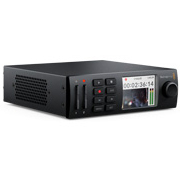 It features a 6G-SDI input that allows capturing video up to 2160p30, and it incorporates one HDMI and two 6G-SDI outputs. It records to two SD card slots, which enable virtually endless recordings. The HyperDeck Studio Mini is housed in a 1RU rackmountable unit but is approximately 1/3 of a rack wide. It features a front panel button control and a jog/shuttle wheel for an analog scrubbing feel. RS-422 control is supported for external control. You can also control the unit using either the USB port or over Ethernet via the RJ-45 connector. An integrated LCD on the front panel allows you to monitor the video.